00:03 hisforeverkid 18:58:38: ACTION[main]: WARNING: Mod name conflict detected: "doors"
00:03 hisforeverkid 18:58:38: ACTION[main]: WARNING: Mod name conflict detected: "ferns"
00:03 hisforeverkid was kicked by ShadowBot: Paste flood detected. Use a pastebin like pastebin.ubuntu.com or gist.github.com. 00:03 Guest68093 has anyone noticed the odd extra large forumspec issue? 00:25 shadowzone stormchaser3000, the development build's hud is bigger than normal. 01:16 Lugal how can I deactivate the debugging info ingame? 01:17 Lugal how can I make there be nothing? 01:17 VanessaE what is the error? 01:18 Lugal lol the error disappeared now^^. it was a missing dependency. so I can deactivate this error view? 01:18 Lugal and the version name? 01:28 kaeza is it right that errors are output to regular chat? 01:29 VanessaE frankly I hate it. 02:11 kaeza Hirato, can you pastebin the error? 04:44 paramat remember i doubled biome size on Aug 21st, do you use the old smaller biome size? 04:47 LazyJ I've been using the 2014_08_20 release of "Watershed". 04:47 LazyJ I just woke up, so I've missed most of the day's events. 04:50 LazyJ It was the last update you made before this recent round. 04:52 LazyJ It will take me awhile to work-in the changes to the code that you've just accomplished. 04:53 LazyJ I run PlantLife, MoreTrees, Trees, Farming, Farming Plus, and an old Berry Bush mod. 04:54 LazyJ To get all of those to work in Watershed, I've had to switch a lot of nodes out. Things like Watershed's dirt for default dirt. 04:55 LazyJ So, I'll get myself a cup of coffee and start working on merging the code. 04:56 LazyJ As for the world itself, I only have a couple builds in it that are worth keeping, and I've learned a few things since, so I'm planning on using WorldEdit to save those few builds, and starting the world over. 04:58 LazyJ Most of my Minetest time is spent on Wazuland2 related business. 05:00 LazyJ Between Wazuland2 matters and touring and observing other servers, I putter on my long-term Watershed world. 05:02 LazyJ My latest efforts haven't been building new stuff, but finding and settling-in some of my better builds from my many other, old builds. 05:03 LazyJ *many other, old worlds. 05:06 LazyJ DevilRomeo2, it's probably very early, Monday morning for most of the experts. They may still be asleep and most will either have class or work to get to after they wake up. 05:07 LazyJ What helps me, when I'm stuck on a mod, is to take a break from it for a while. 05:08 LazyJ Then I try to think of other mods that may be similar, try them out, look through their code, and see if they might do whatever it is I'm trying to accomplish. 05:09 LazyJ If so, then I study those parts and take another crack at my mod. 05:09 LazyJ I spent most of my weekend trying do just that. 05:55 LazyJ Inkscape and GIMP on the high end, KolourPaint on the low end. 05:55 LazyJ Blender too, for meshes and models. 07:18 cornernote why doesnt my sig come up in the WIP Subgames forum ? 07:19 cornernote missing forum setting ? 10:20 raffahacks Shouldn't this channel be renamed to ##minetest? 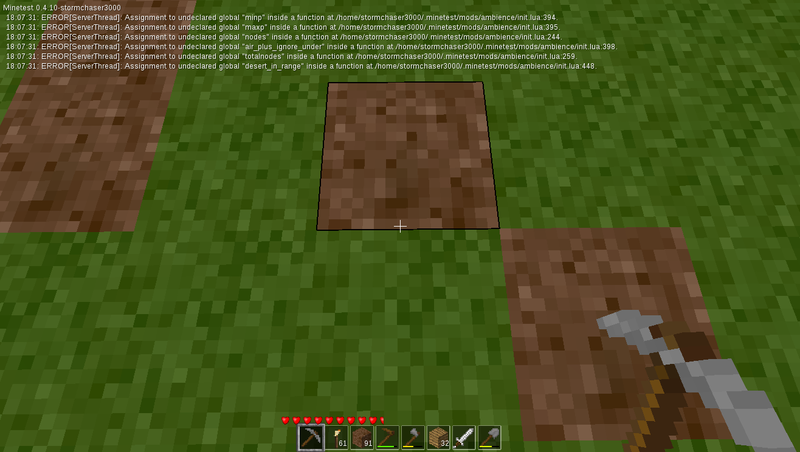 14:38 hoodedice What is print() in minetest? 14:39 hoodedice What is the equivalent of print() in the minetest engine? 14:41 hoodedice Minetest.log() found it. 14:51 hoodedice can't they take variables? 15:00 hoodedice I'm not getting x. 15:07 pitriss hoodedice: minetest.log(tostring(x)) ? 15:13 msanchez does anyone knows whether this is an issue in MT? or maybe the Irrlicht engine ? 15:14 hoodedice umm, which distro? 15:14 hoodedice Can you please get a screenshot of the problem? 15:14 hoodedice does it happen in both distros? 15:18 msanchez It should say "Minetest"
15:19 hoodedice did you compile it anytime as is it, and it still had this problem? 15:21 msanchez ok, I'll do. Thanks! 15:23 hoodedice oh dear, your Intel is a Haswell? 15:23 hoodedice And you're getting OpenGL 1.2? 15:25 n4x 3.0 is new, I would say? 15:30 john_minetest Some onboard ones are pretty slow. 15:31 john_minetest I got a haswell i7 with onboard and it runs minetest on 40-60 fps most of the time though. 15:31 msanchez anyway, this does not seem to be related to the problem with the taskbar, right? 15:31 hoodedice have you checked with gnome? 15:49 Viper168_ is the translation good? 16:02 hoodedice in Minetest code? 16:02 msanchez xprop -name "Minetest [Main Menu]" -format WM_CLASS 8s -set WM_CLASS "Minetest"
16:03 hoodedice how do you run that? 18:42 Krock !tell Tesseract Why do you have this name now? Just wonder. 18:43 Krock human vs toy-fighters? 18:45 sfan5 hoodedice: you have an opinion? 18:46 exio4 Calinou, I would have said "4D cube"
18:47 rubenwardy hoodedice, Jekyll is awesome as a blog tool. Requires you to make your own HTML/CSS theme, of course. 18:47 rubenwardy CSS is a PITA most of the time. 18:47 Krock hoodedice, what are you learning? 18:50 rubenwardy The problem is not learning CSS, it's fairly easy to get going, it's learning how to web design, to make it look good. And how to do CSS right. 18:50 rubenwardy But prioritizing is good. 18:52 Krock 3D design with 3D-glasses! 18:53 rubenwardy I don't really like those sorts of designs. You have to school loads to find useful information. 18:54 Calinou #GamerGate 19 Concierges Sans Salaire - Making the tables turn. 18:54 rubenwardy Minetest is sexist! Why is the player male? 19:16 rubenwardy Is it recommended to use ABMs to grow grass? 19:19 ThatGraemeGuy how would you do it otherwise? 19:27 kaeza Abdul Mujeeb is hoodedice? 19:32 rubenwardy I admit, the folder structure chapter isn't as entry level as it could be. The first few chapter should be very specific - "this is what you need to do, follow these steps" - and the later chapters are more like - "here is the theory, here is some example code, how about you experiment". 19:36 rubenwardy lol. Been doing markdown for too long. 19:38 rubenwardy Any Ideas? I can't think of anything else to say. 19:38 Yellowberry A wild Yellowberry appears! 19:39 rubenwardy What chapters could I combine it with? 19:40 rubenwardy I think I'll leave it on its own. 19:41 Calinou is an IDE for Minetest really useful? 19:42 rubenwardy I am not sure, Calinou. 19:42 rubenwardy It was added to the Intro. Maybe it should be mentioned, and linked to a wiki article on IDEs. 19:43 Krock rubenwardy, could you extend the noob generator with... uhm.. terrorism words? 19:43 rubenwardy I should allow seeds for noobs. We could all share our seeds, then. 19:44 rubenwardy Oh, that's a euphemism, I think. 19:45 rubenwardy Someone could write a minetest linter that shows API suggestions. But not me. 19:46 Calinou have you tried the latest version? 19:47 Calinou use mouse wheel? PgUp / PgDn? 19:48 rubenwardy I want to drag as it is faster than mouse wheel. PgUp works, I guess. (But I have to train myself out of using the scroll bar. 19:52 rubenwardy How can you tell CPU usage on Kubuntu? 19:59 rubenwardy Atom is awful. 20:00 kaeza how exactly does it differ from other "featureful" editors? 20:02 kaeza have you tried it? 20:03 sfan5 Amaz: do you have nodes.txt in your working dir? 20:05 rubenwardy Lol. I meant the guy in Greek mythology, but oh well. 20:06 rubenwardy That book now contains all the information that the intro has. I think. 20:08 sfan5 Amaz: is it the correct nodes.txt? 20:09 Amaz It's the one I downloaded with the repo. 20:11 rubenwardy Will you be contributing it to the online book? 22:04 catninja OldCoder: you seem to be off all other cahannels? 23:00 ciwolsey theres no need for me to distribute mods to players? its done automatically right? 23:02 ciwolsey i dont really understand.. but theres no need for people to get anything if they need to join my server? 23:03 VanessaE as long as they have a client that's up-to-date enough to handle the mods you use, that's all they need. 23:04 ciwolsey so code from the mods is never actually run on the clients? 23:04 VanessaE not yet anyway. 23:05 ciwolsey i was trying out the mobs mod earlier..
23:06 VanessaE maybe a missing inventory image or something. 23:06 ciwolsey does minetest also deal with the removal of mods in a graceful way? 23:07 VanessaE it leaves "unknown node" in places where a previously-defined node had been placed. 23:08 VanessaE if you later re-add the mod, the unknown nodes will become defined again. also you can translate them with e.g. 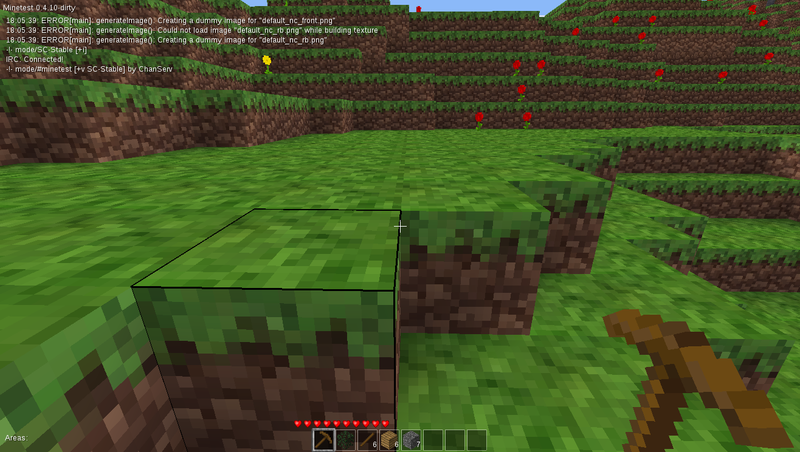 worldedit or by writing a mod that contains suitable aliases. 23:09 ciwolsey is that done using the metadata stuff? 23:09 VanessaE that's an active routine that's moving those entities around or setting the pipes to "water"
23:10 VanessaE no, not with metadata in the case of pipes, but I have an ollllllllllld rewrite that was gonna do just that. 23:10 ciwolsey ok so what part of the api do i need to use to hold state for nodes etc? 23:10 VanessaE it depends on the state you're trying to manage. 23:11 VanessaE some stuff can be done with just flags on the map, such as the node's facedir. more complex stuff needs metadata, like a sign's text. 23:12 ciwolsey is that wrong? 23:13 ciwolsey but meta data is not attached to a node right? 23:13 ciwolsey but the location? 23:13 ciwolsey so you have to deal with cleaning up the meta data when node is removed etc? 23:13 VanessaE metadata is attached to a location on the map, yes, but also to the node at that location - dig the node and the metadata is taken with it, usually destroyed unless your mod is coded to retain that data. 23:15 VanessaE you can, for example, create a node that retains some flag or whatever in its meta, and that when dug continues to retain it. the Memorandum mod works like that. 23:15 VanessaE there's never anything left "in the map" to "clean up". 23:16 ciwolsey yes its cleaned up for me? 23:19 ciwolsey are there any tools i can use just to have a look at the meta data in a certain block? 23:20 VanessaE kaeza: you sure about that? 23:21 kaeza VanessaE, there is one? 23:21 VanessaE kaeza: I don't know of one, but isn't the output from get-meta just a table anyway? 23:26 kaeza err... os.execute was locked down? 23:27 VanessaE kaeza: in SN's strict module, so I thought? 23:28 ciwolsey just make http optional? 23:32 ciwolsey what can you use to create the .x files? 23:34 kaeza isn't .obj static? 23:34 VanessaE either way, don't use .x, it's bloated. 23:37 ciwolsey whats limiting them? the people who write the mobs mods or the engines? 23:37 VanessaE that and, well, AI is hard. 23:38 ciwolsey dont they run on the server in minecraft? 23:48 ciwolsey does the tiles table allow you to specify a texture for each side? 23:58 Tesseract ~tell Krock I have this nick because Tesseracts/HyperCubes are awesome! And I'm still using it because I got disconnected and auto-reconnected with this alt nick and I haven't bothered changing it.